124/365(+1), a photo by Luca Rossini on Flickr. Intense day at work, I left at 17.30 to get home in time to enjoy the undeserved drawn between Italy and Croatia at the European Football Cup. Now we seriously risk to get out of the cup. We have to win agains Ireland but, in the unlucky (!!!) event of a 2-2 between Spain and Croatia we would be out anyway. A few years bak it happened exactly this. Two Scandinavian teams happened to finish their match with a 2-2 and kicked us out. I hope to not be obliged to assist to another unlucky event such that one. After the match we went out for a pizza. Close to our new place there are several options, so we tested one that my sister likes and Claudia remembered to be fine. It was awful. Don’t go there. It’s called Pepito and it is on via degli Stradivari, close to Ponte Testaccio. I think I won’t ever digest the meal. On the way to the pizzeria, we wandered a bit around the neighborhood. It has a very strange atmosphere, between the abandoned and the rich. 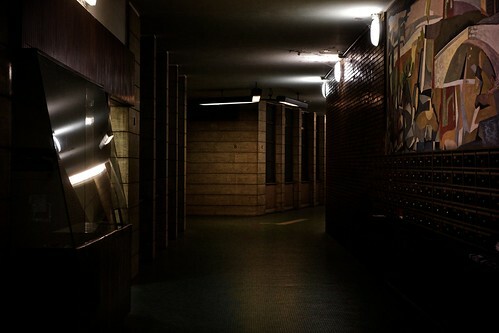 I took a shot of one of the entrance halls of the apartment buildings in the area. I think it conveys the mood.